We set off to rediscover a village we had visited quite a few years ago. Dad's memory of Moira was off course to do with food, namely the renowned butchers. I remembered there were independent shops which had all sorts of unique gifts or things which I love to look at and to buy. We ambled along stopping at an art shop which also had other times for the homeware or gifts. We felt welcome just to browse in the relaxed atmosphere. The shop was thoughtfully laid out with things to catch my eye in every nook I could find and I think I found all of the secret corners. One shop both of us had forgotten about was The Barrow. The front section was a fruit shop but behind that there is a secret garden. We had already stocked up on fruit and veg otherwise I could have bought a lot in there, especially the local apples which looked very rustic and appealing. The secret garden was still there although as you can imagine it's not the best season to see colourful blooms but there was plenty of items which both of us wanted to focus our cameras on. 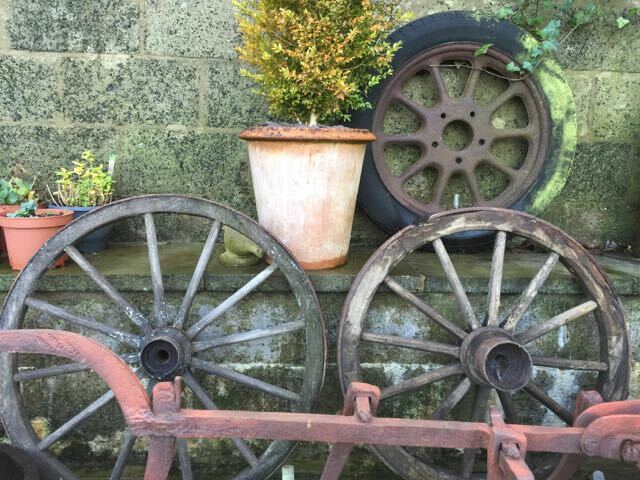 Old chimney pots, a Belfast sink, rusty churns, wheels, the list went on. The owner of the shop was intrigued about our interest in the old rusty ornaments and off course this was a starting point of conversation with the owner and dad. We will be back to this shop when we return to Moira and will buy some of the fresh fruit and vegetables. I have included a few photos in this blog to give a glimpse of how many things can be found hidden at the back of a small fruit shop. Next time we will take a photo of the front of the shop. Before we started to buy our food supplies we had to visit the top floor which is now a unique coffee shop. Coffee was served on two floors (the lower floor behind the deli and upstairs) we were glad we went upstairs as there was a lovely stylish setting which both of us enjoyed relaxing in. Maybe I should say relaxing wasn't just sitting it was seeing those photos we wanted to take to remember our visit. Coffee was served and yes, it passed my test. We had our usual, mine being the espresso which was served in a pretty glass cup which sparkled and was topped off with with a good cremà which promised a good coffee experience. Both coffees were enjoyed and we would revisit when we go back to Moira. I will let the photos tell the story of the shop in a small village it is exemplary. We could buy almost everything we need in a shop like this and only need to visit the fruit shop to buy those rustic apples and home grown tomatoes. Personally I just can't go into supermarkets so this was a big shop to me. We will be back with a list of other things which caught my eye, tempting me to buy to make some thing special for dad. I wouldn't tell the story of another lovely shop although I regret leaving the things dad wanted to buy for me. Imagine I refused to buy clothes (obviously I must have been tired) I can still see the cosy top I should have brought home. The lady in the shop was very friendly and didn't mind how many things I tried. The last shop was in fact the shop we parked outside and had glanced into before going to explore the rest of the village. The shop was full of my type of things, bags, notebooks, paper, cards plus lovely non paraffin wax candles. The warm scent was all around us, not over powering but reminding me of our kitchen when I was a child and mum was baking. This shop had more memories which were revealed as we started to chat to the owner. We all chatted then we discovered the owner had gone to the same primary school as me, although she left in primary two. I wouldn't detail our conversion as this blog would be like a book. Pieces of a big jigsaw placed together through dad's memories and mine we discovered we both 'knew of' each other from attending the same church. (I wouldn't mention boyfriends) The lady now owns The Topiary Tree and through the warmth of her welcome we had a wonderful end to a most pleasant day. A personal note from me on friends. I know I have had my struggles recently but over the past months I have also been in touch with a friend from grammar school who has been so kind to both of us. Good old fashioned friendships made years ago will never fade and it's these type of friendships I treasure. Remembering times when we didn't go online, we had face to face friendships with nothing expected of us to keep up appearances. I don't feel I can express how memories like this make me feel. To end our day we were crossing the road and just caught sight of the sun setting. From the rising of the sun to the going down of the same.